Integrated Payroll Services (IPS) keeps making things better for our clients. By constantly pursuing and developing improved technology solutions – and effectively integrating them with our proven processes – IPS helps HR professionals stay ahead of the challenges they face. For example, IPS offers innovative new software for Payroll Management, Talent Acquisition, Benefit Enrollment, Time & Attendance and much more. By using our proprietary "IPS 360°" platform, IPS gives you a single-database approach that essentially makes every HR management process faster and more efficient, while also ensuring flexible access and integrity of all records. But although our technology is impressive and beneficial, it’s only one reason to choose IPS. Our service is the other big difference. 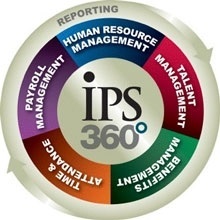 As an IPS client you get a dedicated Account Manager (often a certified payroll or HR professional) who knows your business and is trained to support the entire IPS 360° platform. Working with IPS simply means you improve your HR management/payroll capabilities, resulting in streamlined processes for your employees, better bottom-line results for your department, and fewer nightmares or headaches for your staff. Choose a partner that asks the right questions and gives you better answers. IPS keeps making things better for our clients. By constantly pursuing and developing improved technology solutions – and effectively integrating them with our proven processes – IPS can help you stay ahead of the challenges you face. For example, IPS offers innovative new solutions for Payroll Management, Talent Administration, Benefit Enrollment, Time & Attendance and much more. By using our proprietary “IPS 360°” platform, IPS gives you a single-database approach that essentially makes every HR management process faster and more efficient, while also ensuring flexible access and integrity of all records.